Iron was not used in the building of the first two Temples, as the verse states: “The House, when it was in building, was built of stone finished at the quarry, and there was neither hammer nor axe (nor) any tool of iron heard in the house, while it was in building.”8 Why? Because iron is used in the fashioning of weapons used to shorten life, and the purpose of the Temple was to “make peace” between man and G‑d, thereby lengthening one’s life. Thus, it is improper to build a life-sustaining structure with a material that is its very antithesis. However, the Lubavitcher Rebbe explains at length that in the messianic era, when “swords will be beaten into plowshares” and iron will be used only for the positive, this prohibition of using metal in the structure of the Temple will no longer apply. The Hebrew word for iron is ברזל, which the Arizal explains is an acronym for the four wives of Jacob, from whom the Jewish nation is descended: בלהה רחל זלפה לאה.10 This corresponds to the mystics’ explanation that in the era of redemption, women will be on a higher level than men. May the merit of learning about the building of the Temple stand us in good stead, and may we merit the rebuilding of the Third Holy Temple speedily in our days! For more on that, see Did the Jews Disregard Ezekiel’s Prophecy of the Temple? Midrash Tanchuma, Tzav 14; Yalkut Shimoni on Ezekiel 43:10–11 (382). See Likkutei Sichot, vol. 18, p. 411. Mishneh Torah, Hil. Beit HaBechirah 1:4. See Ezekiel ch. 40 with commentaries. See Sefer HaSichot 5752, p. 233. Arizal, Sefer HaLikkutim, Genesis 49:11. See Yalkut Shimoni, end of Isaiah. 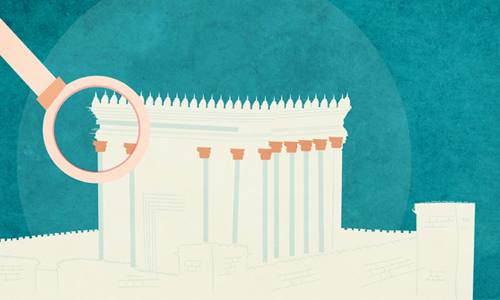 Which Objects Were Present in the Holy of Holies? Is It Kosher to Make a Seven-Branched Candelabra? I am very happy with the explanation of the word barzel! I think He is being a bit too Zealous!